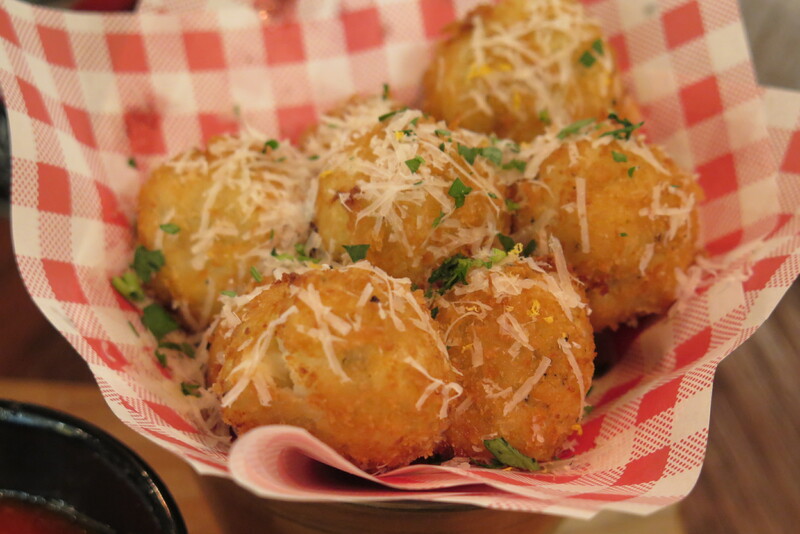 Jamie’s Italian is without a doubt one of the most successful Italian restaurant brands in the world. 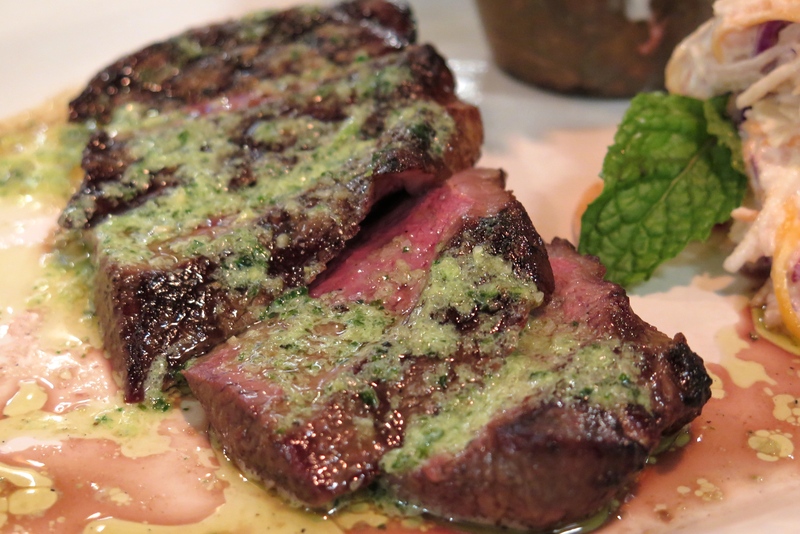 Proof of this is a fully packed restaurant on weekday evenings and the reason behind its popularity is pretty simple. With delicious food, strong cocktails and warm atmosphere, Jamie’s Italian offers diners a taste of Italy with a contemporary style in its rustic dishes and prices are made affordable for the masses, so that every one can enjoy the Italian way of life ~ “Good food for everyone, no matter where they’re from or how rich or poor they might be” – Jamie Oliver. 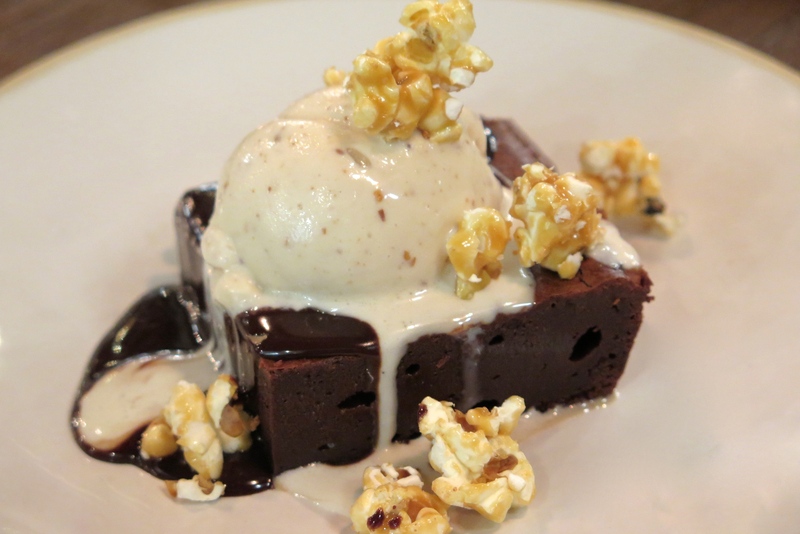 The first Jamie’s Italian in Singapore was debuted in 2013 at VivoCity, and two years later, this well-respected Italian restaurant brand has unveiled its second outlet in the heart of Orchard Road. 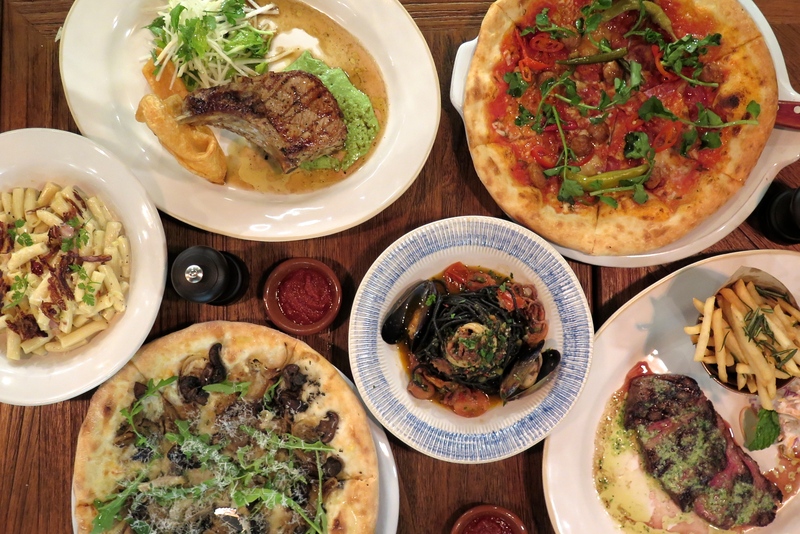 The 140-seater Jamie’s Italian Forum at Orchard showcases a smaller, curated menu of Jamie’s Italian favourites, alongside a chic selection of freshly made artisan pizzas. The kitchen in Jamie’s Italian Forum at Orchard is under the supervision of a young, visionary gentleman – Head Chef Kwek Xiu Rong, formerly Sous Chef at Jamie’s Italian VivoCity, is the first local Singaporean to lead a large team of kitchen staffs and chefs, ensuring that the level of excellence, consistency and quality are maintained across Jamie’s Italian. 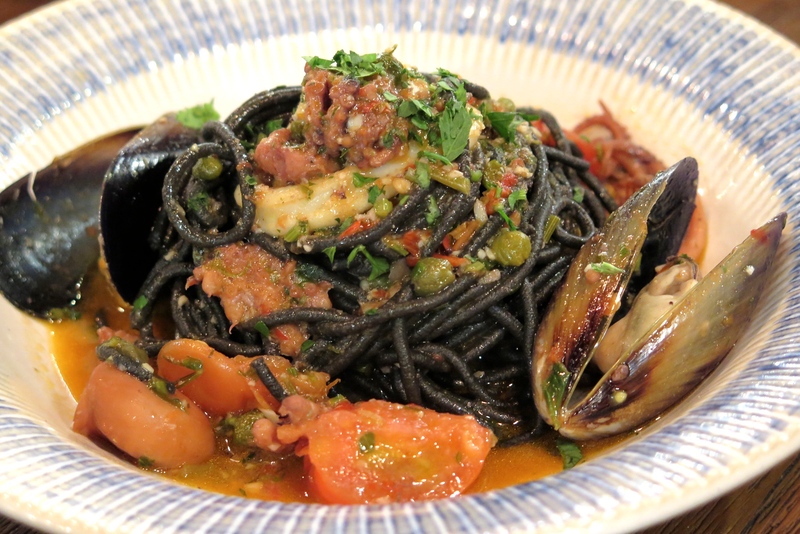 The best of Jamie’s Italian pastas are spontaneous and comforting. Guests are sure to experience well-loved pasta dishes in the same style and consistency. 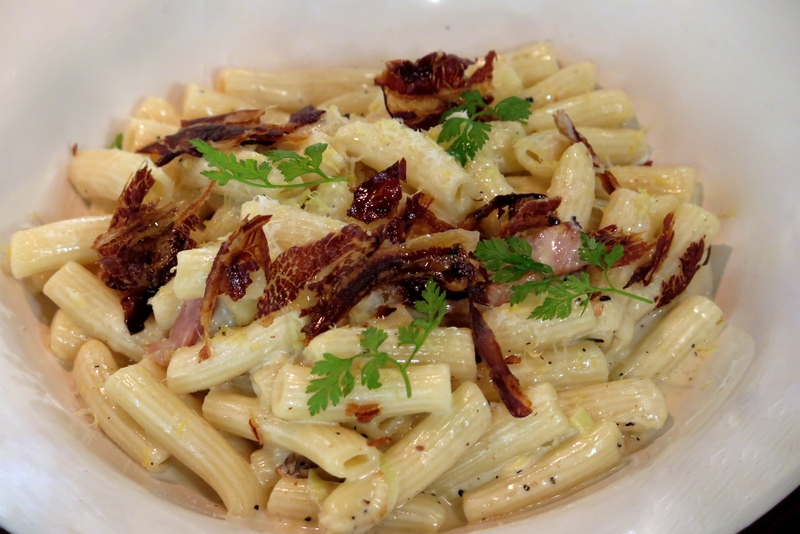 Toothsome Penne Pasta ($23.50) tossed with crispy chunks of smoked pancetta and sweet buttery leek are finished with a touch of traditional carbonara sauce, which was creamy without being overly rich. Seafood lovers would do well to savour the aromatic prawn linguine ($18.00 / $26.00) topped with fried garlicky prawns, shaved fennels, chilli, tomatoes and rocket; or sink your teeth into the Black Squid Ink Spaghetti ($17.00 / $25.50) with mussels and octopus, tossed in white wine sauce with parsley, chilli and capers. 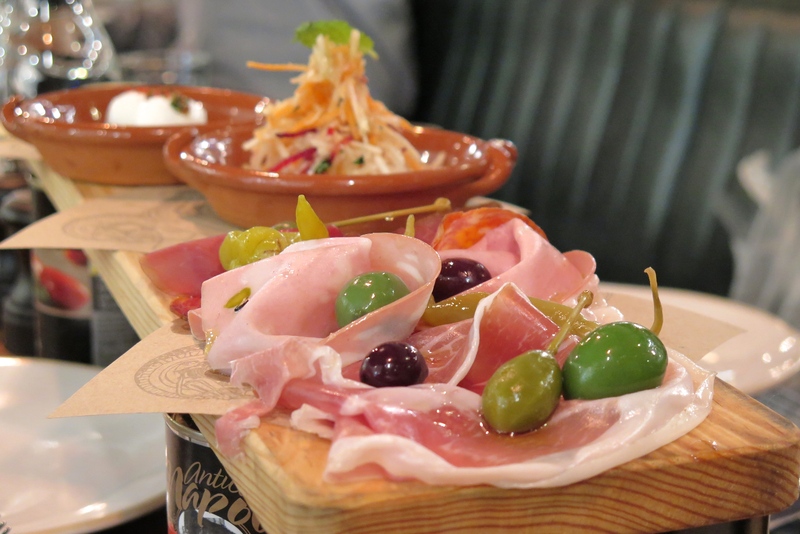 Jamie’s Italian Forum at Orchard is the first outlet in Singapore to serve hand-made artisan pizzas. All the doughs are hand made fresh daily, and baked to order. 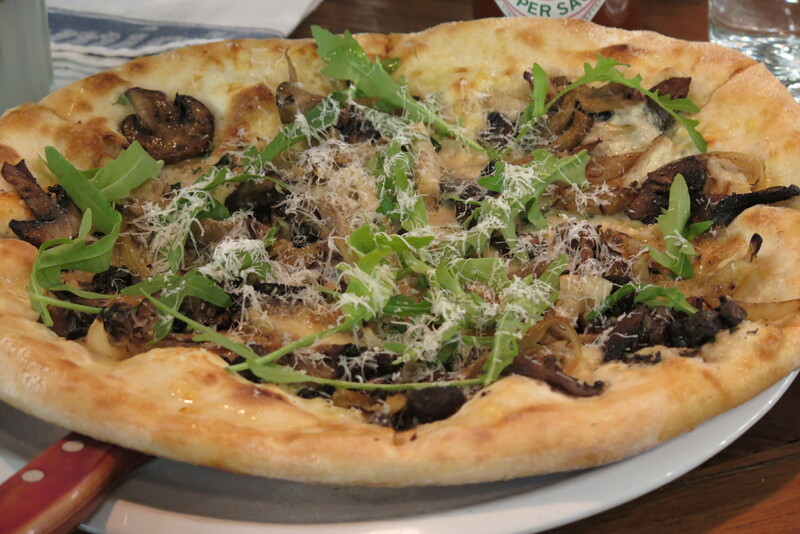 Popular pizza options include the classic Margherita ($21.00) and the Funghi ($23.50) topped with cheesy béchamel, truffle cream, porcini mushrooms, smoked mozzarella and peppery rocket. 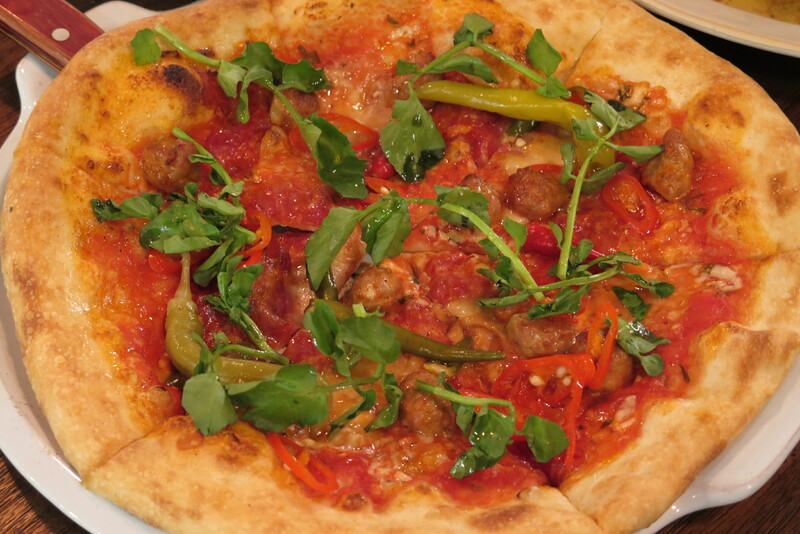 For those who love the spicy zing of chilli padi and pickled chills, the Italian Hot ($24.50) with spicy meatballs and soppressata is obviously the pizza you want to choose. Pastas and pizzas are really the best things going here, but if you’re craving for wholesome steaks or fowl, have a look at the restaurant’s blackboard for in-season specials, as well as some of the signature classics like Grilled Pork Chop ($38.00), 30 day matured Prime Sirloin ($45.00) or the garlicky, buttery Rump Steak ($32.00) and the Chicken Al Mattone ($29.00) with a creamy wild mushroom sauce. 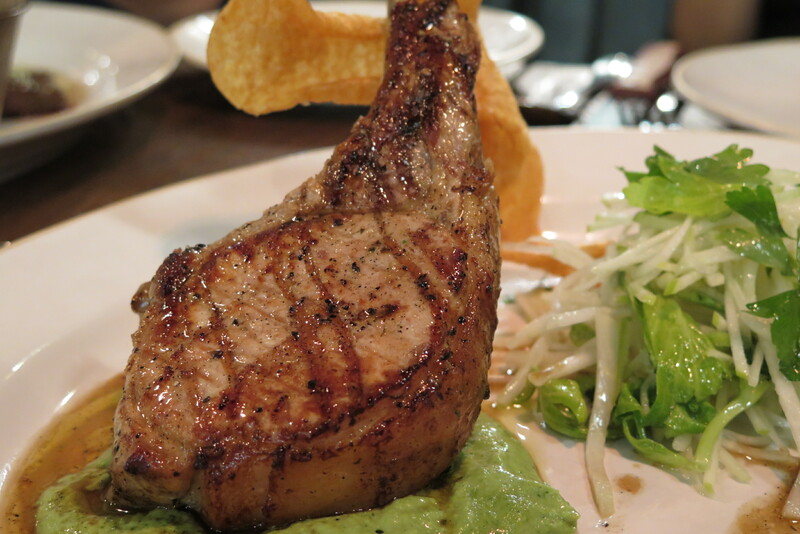 All hands down to the Grilled Pork Chop which was well-marinated and cooked to perfection under a brick, resulting in a moist and succulent bite. Served with parsley bagna caudal and a crispy crackling for that extra nom. 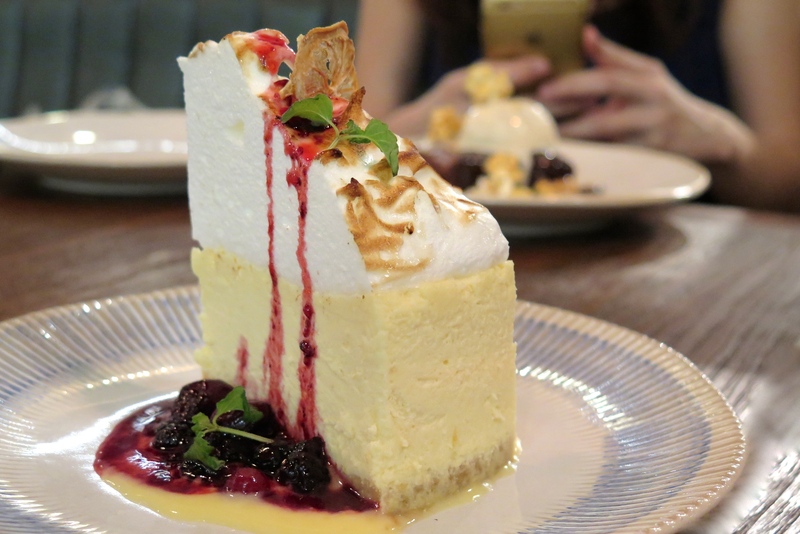 Desserts like the warm fudgy Epic Brownie ($12.50) topped with amaretto ice cream and caramelised popcorn; or Lemon Meringue Cheesecake ($12.50) served with lemon curd and blackcurrants are homey enough to keep a smile on your face. 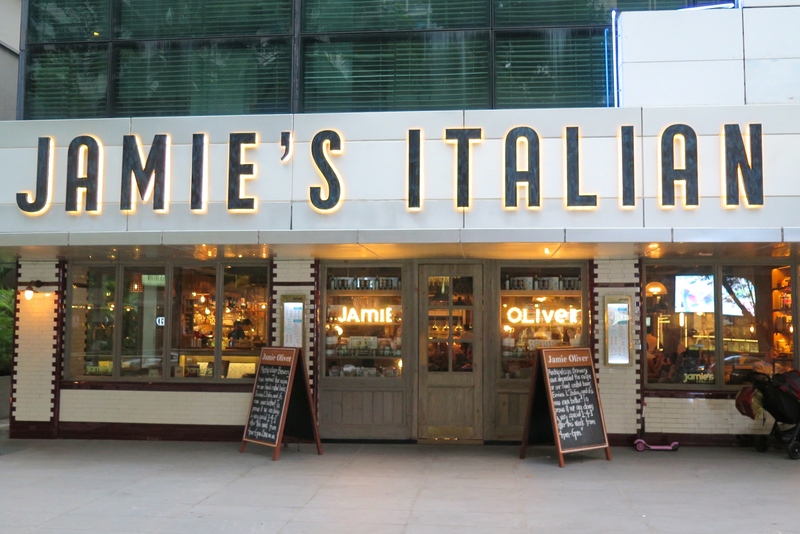 Jamie’s Italian Forum at Orchard is open in the morning at 10am everyday for guests to enjoy Italian Musetti coffee with a selection of Italian artisan pastries. Come by the evenings to unwind yourself with a glass of tipple from the extensive bar menu, while nibble at the famed Jamie’s Italian ‘Antipasti Planks’ ($16.50 per person) and delectable starters like Cauliflower Fritti ($13.50), Crispy Porcini Mushroom Arancini ($12.50) and Crab & Avocado Bruschetta ($14.50).